In 2014 the concrete industry consumed 107 times more recovered and waste material than the waste it sent to landfill. This fact demonstrates that the concrete industry is a net user of waste. 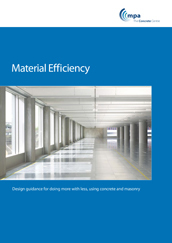 As part of the Concrete Industry Sustainable Construction Strategy the industry has also committed to Resource Efficiency Action Plans (REAPs).